In this modern age of antibiotic-resistant infections, pandemics and other public health threats, infection control and the prevention of cross-contamination in facilities is of paramount importance. Building service contractors have a social responsibility to provide quality cleaning services in the facilities they clean — whether they're hospitals, schools or office buildings. That requires a specialized knowledge of proper cleaning techniques, awareness of the preferred chemicals on the market, and a commitment to employee training. While the focus of cross-contamination prevention strategies usually centers on cleaning, disinfection and sanitation of surfaces, towel and tissue products also play a role. Towels are used by janitors to clean surfaces that are contaminated by potentially infectious bodily fluids. The proper drying of hands using towels is also an integral part of proper hand washing for building occupants. And tissues help capture bacteria and viruses expelled through coughing and sneezing. The development of anti-viral tissues and anti-bacterial hand towels are new product innovations that may help revolutionize hand hygiene and reduce cross-contamination. In hospitals and medical facilities, the cleaning of anything that might be considered a biohazard, such as blood, urine or other bodily fluids, is done with disposable towels rather than microfiber cloths. Infection control refers to the prevention of nosocomial, or healthcare-acquired, infections, which include Staphylococcus aureus (Staph), methicillin-resistant Staphylococcus aureus (MRSA) and tuberculosis. Cleaning practices that target the prevention of cross-contamination are important to protect patients and building occupants from these infections, but it's also important to protect janitorial staff. "For infectious areas where bodily fluid may be present we use paper towels," says Rene Brunal, director of operations for Beelabor Janitorial Services Inc. in Fairfax, Va.
"We order paper towels specifically for that type of cleaning. Anywhere that bodily fluids may be present, we use disposable paper towels," he says. Paper towels can be partnered with absorbents and biohazard cleanup kits for cleaning in healthcare facilities. BSCs must focus on the prevention of cross-contamination by sanitizing and disinfecting hard surfaces, especially touch-points, such as door knobs, push bars, elevator buttons, stair railings, and other areas commonly touched by occupants' hands. Touch points at personal workspaces such as desks and cubicles are typically left to the discretion of the individuals working in those spaces, Brunal says. "A lot of our customers look at the desk as a very personal area. And the office managers don't push for that area to be cleaned," Brunal says. 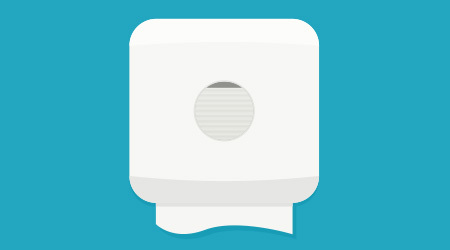 In public areas such as restrooms and break rooms, most facilities provide either touchless towel dispensers, manual dispensers with rolls or folded towels, or hand dryers. A majority of customers want at least a mid-grade towel — and will invest in that type of product rather than go the more inexpensive route with a low-quality paper towel, says Brian Schindler of HOTT Associates in Cleveland, Ohio. "It's really, do they want a nice towel or do they want a cheap towel? And 90 percent of ours want something mid-range to nice," Schindler says. Providing quality hand towels helps to encourage proper hand washing, he says. And that is something that cleaning contractors can help with in any building, regardless of how much control BSCs have over the purchasing of paper products. BSCs have a varying level of involvement in the choice of products used in a facility. Some purchasing agents are completely in control of the towels and tissues used, while others may seek product advice from their cleaning company. Depending on the contract, a customer may also want the BSC to take care of the buying and stocking of paper products, in which case it would go through its distributor. Carmen Casabielle, corporate director of sales at Dade Paper Company in Miami, says education about proper hand washing is key to helping building occupants create a healthier workplace. Those who don't follow the steps of proper hand washing "actually do end up cross-contaminating the moment they walk out of that restroom," Casabielle says. "Before you know it, you're spreading illness throughout the place you're working. It is a project to try to avoid that, and in doing so, it not only increases awareness but people feel good about where they're working." Drying hands, she says, is the final step in proper hand washing. "By having a good towel and tissue program, that is going to make sure that your employees dry their hands accurately, that in itself is going to help reduce the spread of illness," she says. "Because keeping your hands moist with water is just an avenue for germs to be attracted to and to continue the spread of illness." Dade tests its towels for absorbency — which is the most important factor in determining the efficacy of a towel. "The first thing I do is the vial test," Casabielle says. "I look for absorbency. I don't look for looks, for texture. I strictly make sure that the towel is absorbing what is left on the hands. Is it getting the job done?" Towel dispensers should be located near sinks, with easy access to trash receptacles. Of course, towels are just a part of the equation; tissues are also important to preventing cross-contamination. Tissue fits into the greater healthy workplace strategy, preventing cross-contamination by catching the spray of tiny moisture droplets expelled by coughs and sneezes — which otherwise go airborne or land on surfaces. Tissues should be placed where they will be used: restrooms, common areas and at individual desks. Trust in paper products are taken to a whole new level when those products claim to provide anti-viral or anti-bacterial protection. Many BSCs may not have heard of anti-viral tissues, but they are being marketed to consumers on store shelves. These tissues come with an additional inner layer that contains a moisture-activated anti-viral formula that kills 99 percent of cold and flu viruses — which can live on surfaces for up to two days — within 15 minutes. An antibacterial hand towel, currently only available in Canada, claims to minimize the residual bacteria left on hands after they are washed by releasing an active antibacterial ingredient that transfers from the towel to the hands. That ingredient provides additional antibacterial effectiveness for half an hour. While these innovations might take years to catch on, most BSCs will continue to support what they believe works best: a touch-free restroom that lessens or eliminates what building occupants are touching in the first place. "Making towel and tissue available in the right places helps with infection control and cross-contamination," Brunal says. "They are the easiest to use, especially if they are touchless."